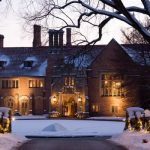 You can find more Santa Claus visits and things to do in Metro Detroit and Oakland County, Michigan during the holiday season on our 2018 Christmas Events Page for Oakland County and Metro Detroit, MI. 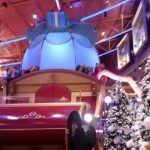 Enjoy Santa, a magician, music, and fun. For cost info and to pre-register, call 248-203-4300. Children will enjoy a scavenger hunt while they wait to see Santa. Families will also enjoy viewing a variety of wonderfully decorated trees in the charming manor home during their visit. Call 248-645-3149 for ticket info and to reserve. Reserve by 11/29/18. Tickets may be purchased at Hunter Community Center and include lunch, a visit with Santa and a small gift. Bring your own camera for pics. Tickets are limited. 248-589-0334 for details. 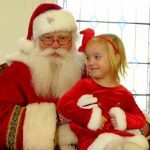 Visit Santa, decorate cookies, make a craft and more. Adult must accompany child. Professional take home photo provided at no additional cost. Call 248-846-6558 to register. A separate Breakfast with Santa event also scheduled the same day at 9a. Must pre-register for both. Take a special photo with Santa near the beautiful Campus Martius Park Ice Skating Rink. Hours – More Info. 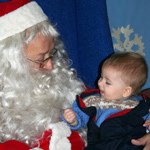 Kids (and adults) can visit with Santa, go on a hay ride, and make seasonal crafts. 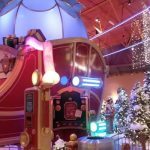 Don’t stand in line at the mall, Hudson Mills Metropark will have small groups, and you can use your own camera for that perfect Holiday moment. Please preregister, 734-426-8211. $5. A Metroparks vehicle entry permit is required for these events. Daily & Annual vehicle permits are on sale NOW. You can pick one up at metroparks.com OR visit your local Metropark today. Each child will receive breakfast, treat bag and picture with Santa. Please register early by calling 248-544-6767. “Listen in as your little ones share their Christmas wishes with the elf himself. Santa will make his annual stop in Josephine Ford’s Playhouse to visit with your children. You can snap your own family photos to cherish this holiday moment. Santa will send each child home with one of his favorite sweet treats”. Hurry, these events sell out quickly. 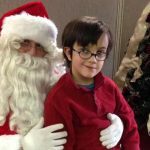 Unique event where games are played, crafts are made and snacks are served while you get to visit with Santa and Mrs. Claus. Santa’s helpers will take your photos, but you are welcome to bring your own camera and snap as many photos as you please. Admission by advance ticket purchase only. Tickets go on sale November 1 at the Park Office of Lake St. Clair Metropark. Please preregister, (586) 463-4581. $7 Adult, $4 Child. A Metroparks vehicle entry permit is required for these events. Daily & Annual vehicle permits are on sale NOW. You can pick one up at metroparks.com OR visit your local Metropark today. Snacks, crafts, activities and more. Of course you will have time to visit with the big man himself! Don’t forget your camera. For ages 10 & under with parent. Pre-registration required. Contact 248-541-3030 for cost info & to register. A different take on Santa pics? Enjoy a breakfast of green eggs and ham, have your pic taken with the Grinch during a reading of How the Grinch Stole Christmas. Bring your camera. For ages 1-8. Call 248-391-0304 ext 3500 for cost info and to register. Mondays through Saturdays from 10a-9p, Sundays from noon-6p, & 9a-4p on Christmas Eve. Shortcuts to Santa via fastpass online reservations. Photo packages begin at $24.99. Visit laurelparkplace.com for details. Enjoy a dinner, along with some festive activities and a visit from Santa and Mrs. Claus. 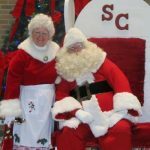 Parents are encouraged to bring their own cameras to capture this time with Santa and Mrs. Claus. Call 248-589-2294 to pre-register. 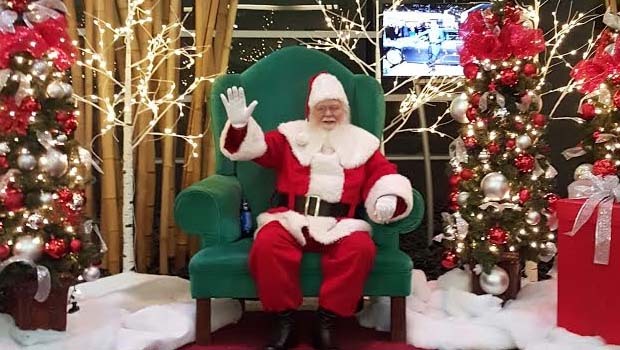 Keeping your time with Santa personal, there won’t be a professional photographer at the mall. You are encouraged to bring your own camera to document your Santa sighting. For more info, visit www.meetmeinmilford.com. 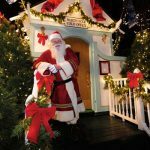 Each visit includes a horse-drawn hayride or sleigh ride, a holiday sing-a-long, (complete with blankets, song sheets, and jingle bells), snacks, (fruit, cookies, juice, hot cocoa, and coffee), and most importantly, a visit with Santa by the Christmas Tree. Tickets are only available in advance at the Park Office, and can be purchased over the phone or in person. Call the Park Office at 810-227-8910 for ticket sales and info. Once on sale, tickets go fast! Please preregister. $10. A Metroparks vehicle entry permit is required for these events. Daily & Annual vehicle permits are on sale NOW. You can pick one up at metroparks.com OR visit your local Metropark today. Sing Christmas carols, play games, visit Santa, and make holiday crafts. Hot cocoa and cookies will be served. Use your own camera to capture the perfect holiday memory. Admission by advance ticket sales only, 734-782-3956. $6. A Metroparks vehicle entry permit is required for these events. Daily & Annual vehicle permits are on sale NOW. You can pick one up at metroparks.com OR visit your local Metropark today. Enjoy quality time with your family, a personal one-on-one visit with Santa and a delicious breakfast. Just $5 per person and proceeds benefit Toys for Tots. Seating is limited and reservations can be made online. For more info, call 248-349-1399. 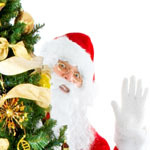 FREE Santa visits by online reservation format. Included is a Holiday Open House for everyone of all ages to view the farm. Bonfire, kids activities, photo booth, and more. Donations are appreciated. Visit www.mayburyfarm.org for details on how to book an appointment. 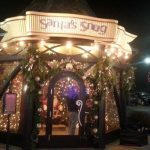 Lunch with Santa – bring your camera! Call 248-347-0445 for cost info and to register. Must pre-register. Includes pancakes, sausage, donuts, juice, crafts, hot chocolate bar, special gift, Paradise Park attractions specials, and pics with Santa. Bring your cameras. Early bird discount if you pre-register. 2 & under FREE with parent admission. 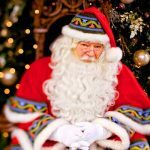 Enjoy lunch and a visit with Santa. Make a holiday craft to take home and go for a horse-drawn wagon ride, weather permitting. Use your own camera to capture special holiday moments. Please preregister, 586-752-5932. Located at Wolcott Mill Camp Rotary – 20505 29 Mile Rd $4 Adult, $7 Child. A Metroparks vehicle entry permit is required for these events. Daily & Annual vehicle permits are on sale NOW. You can pick one up at metroparks.com OR visit your local Metropark today. Santa and Mrs Claus visit the Museum to meet with the children of our community. A wagon ride takes you from the Dairy Barn to the Van Hoosen Farmhouse and fresh-baked cookies await you. Don’t forget your camera. Register by calling 248-656-4663. The Dinosaur Hill Nature Preserve in Rochester will hold their annual Story Time with Santa program. Bring your camera. More info. Join Old St Nick as he takes a breather from his busy holiday schedule to enjoy a delicious buffet-style breakfast or dinner w/Santa at the Detroit Zoo. Seating is limited and advance reservations are necessary. Call 248-541-5717 and press 9 for ticket information. Bring your camera. 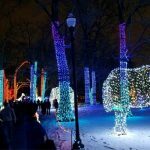 Visit DetroitZoo.org to purchase tickets. Bring your list and visit Santa. There will be seasonal crafts, guest musicians and goodies to eat. 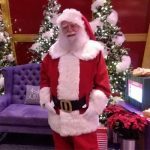 Photos with Santa are taken on your own phone. Please preregister, 586-781-9113. $3 Adult, $6 Child. A Metroparks vehicle entry permit is required for these events. Daily & Annual vehicle permits are on sale NOW. You can pick one up at metroparks.com OR visit your local Metropark today. 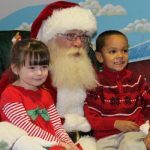 Enjoy story time, games, crafts, and a special visit with Santa! Bring you camera. $5 per member, $10 per non-member, $5 walk-in fee if not pre-registered by 12/10. Contact Laura for more information or to register at lbarrick@ffrc.net. Professional photo options are available for purchase with different photo package options. No personal cameras allowed. You can even book your reservations to see Santa online via Santa Fast Pass. 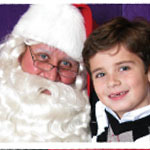 For more info on hours, Santa break times, and prices for professional photo packages, visit www.oaklandmall.com. Take pics with The Grinch when you visit Santa at Oakland Mall. For more info, visit oaklandmall.com. Includes pancake, sausage, milk or juice AND a 5x7photo with silver frame and holiday craft activity with Mrs Claus. Fun-filled morning of Christmas craft-making, plus holiday matching game, festive story with Cheddar the Mouse, sweet treats, and a special visit with Santa Claus. Space is limited, advance registration is a must – 248-524-3570. Here’s a great way to attract animals – put out edible decorations for them. Each child will make some ornaments to hang up outside. Join Santa Claus as he tells a few tales about animals he has observed. Everyone will talk with Santa personally, and receive a small gift from him. Bring your cameras and take pictures of your little ones with Santa.. For cost and registration info, call TNS at 248-688-9703. Hosted by West Bloomfield Parks. Bowl with Santa and his friends. Afternoon includes 2 games of bowling, shoes, pizza, pop, and a family picture. Register at wbparks.org or call 248-451-1900. Remember to bring your camera and get some great Santa Claus pictures. Space is limited and registration for one of the following times: 10a-10:30a, 10:30a-11a, 11a-11:30a,. 248-698-4942 for details. White Lake residents may register the first week of registration. Non-residents may then register as space allows. Call 248-698-4942 ext 3. Santa will be here to visit with boys and girls who are eager to share their Christmas list with him. Children will also decorate a cookie and have fun making holiday crafts. Use your own camera to capture the perfect holiday memory. This program fills quickly. Please preregister, 248-625-7280. $5. A Metroparks vehicle entry permit is required for these events. Daily & Annual vehicle permits are on sale NOW. You can pick one up at metroparks.com OR visit your local Metropark today. 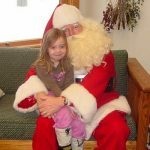 Activities include a pancake breakfast and a visit with Santa for all children 10 and under. To register, call 248-624-1055. STAY TUNED! 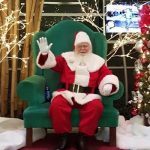 More Santa Claus Visits Metro Detroit 2018 coming soon!